WHAT'S INSIDE 3 Art Show 4 Walk in the Past 5 Library presentation 6 Editorial 7 Letters to the Editor 8 Well Workshop 9 Museum Updates 9 Heroes Appreciation 10 Restaurants 10 Gem Club news 11 The Salvation Army 12 Around Town 13 QIA, then and now 14 Music in the Desert 14 Party in the Park 14 Scholarship 16 Retirement, but not farewell 26 Herb Mama 26 Nancy's Kitchen 28 Bingo 29 Music in the Desert 31 In Memoriam 31 Music Jams 32 Puzzles 34 Churches 36 Arrest Report 37 Classifeds 37 Paul Winer's Cartoon www.DesertMessenger.com • "Quartzsite's FREE Community Paper" • 928-916-4235 WEDNESDAY, February 20, 2019 VOL. 15 # 294 Now in our 1 5 t h YEAR! Alwa y s FREE! 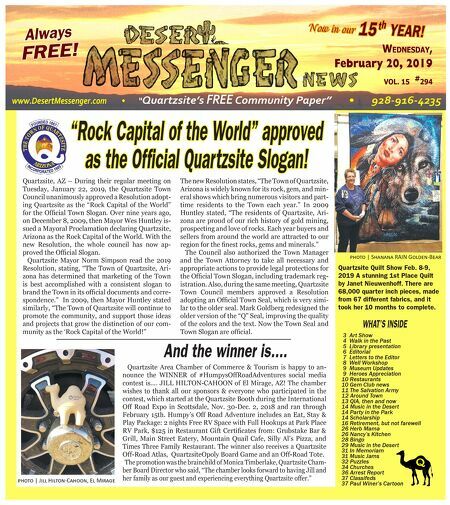 February Paul Winer's Cartoon ����� | S������ RAIN G�����-B��� And the winner is.... "Rock Capital of the World" approved as the Official Quartzsite Slogan! Quartzsite, AZ – During their regular meeting on Tuesday, January 22, 2019, the Quartzsite Town Council unanimously approved a Resolution adopt- ing Quartzsite as the "Rock Capital of the World" for the Offi cial Town Slogan. Over nine years ago, on December 8, 2009, then Mayor Wes Huntley is- sued a Mayoral Proclamation declaring Quartzsite, Arizona as the Rock Capital of the World. With the new Resolution, the whole council has now ap- proved the Offi cial Slogan. Quartzsite Mayor Norm Simpson read the 2019 Resolution, stating, "The Town of Quartzsite, Ari- zona has determined that marketing of the Town is best accomplished with a consistent slogan to brand the Town in its offi cial documents and corre- spondence." In 2009, then Mayor Huntley stated similarly, "The Town of Quartzsite will continue to promote the community, and support those ideas and projects that grow the distinction of our com- munity as the 'Rock Capital of the World!" The new Resolution states, "The Town of Quartzsite, Arizona is widely known for its rock, gem, and min- eral shows which bring numerous visitors and part- time residents to the Town each year." In 2009 Huntley stated, "The residents of Quartzsite, Ari- zona are proud of our rich history of gold mining, prospecting and love of rocks. Each year buyers and sellers from around the world are attracted to our region for the fi nest rocks, gems and minerals." The Council also authorized the Town Manager and the Town Attorney to take all necessary and appropriate actions to provide legal protections for the Offi cial Town Slogan, including trademark reg- istration. Also, during the same meeting, Quartzsite Town Council members approved a Resolution adopting an Offi cial Town Seal, which is very simi- lar to the older seal. Mark Goldberg redesigned the older version of the "Q" Seal, improving the quality of the colors and the text. Now the Town Seal and Town Slogan are offi cial. Quartzsite Area Chamber of Commerce & Tourism is happy to an- nounce the WINNER of #HumpysOffRoadAdventures social media contest is.... JILL HILTON-CAHOON of El Mirage, AZ! The chamber wishes to thank all our sponsors & everyone who participated in the contest, which started at the Quartzsite Booth during the International Off Road Expo in Scottsdale, Nov. 30-Dec. 2, 2018 and ran through February 15th. Humpy's Off Road Adventure includes an Eat, Stay & Play Package: 2 nights Free RV Space with Full Hookups at Park Place RV Park, $125 in Restaurant Gift Certifi cates from: Grubstake Bar & Grill, Main Street Eatery, Mountain Quail Cafe, Silly Al's Pizza, and Times Three Family Restaurant. The winner also receives a Quartzsite Off-Road Atlas, QuartzsiteOpoly Board Game and an Off-Road Tote. The promotion was the brainchild of Monica Timberlake, Quartzsite Cham- ber Board Director who said, "The chamber looks forward to having Jill and her family as our guest and experiencing everything Quartzsite offer." ����� | J��� H�����-C�����, E� M����� Quartzsite Quilt Show Feb. 8-9, 2019 A stunning 1st Place Quilt by Janet Nieuwenhoff. There are 68,000 quarter inch pieces, made from 67 different fabrics, and it took her 10 months to complete.